We want Ambi Climate to delight you the moment you take it out of the box, and we want the setup process to be a breeze. That's why we built a database of infrared codes to control your air conditioner. This means that you don't have to push a bunch of buttons on your remote to program it into our system! At the moment we currently support remotes that have an LCD screen. 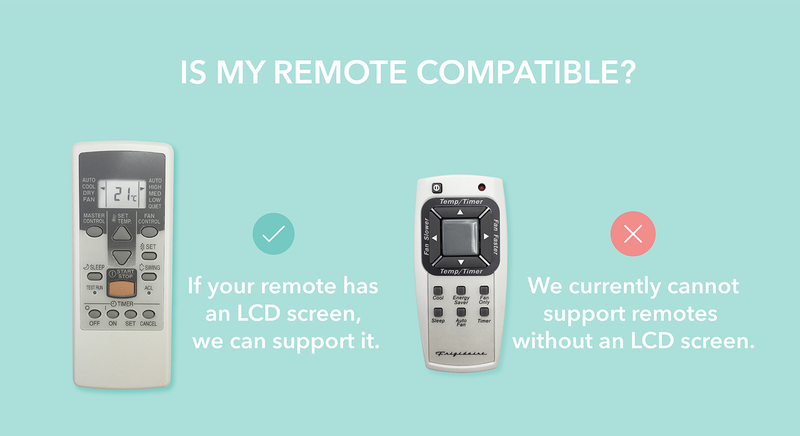 If your remote does not have an LCD screen, please get in touch before ordering so that we may verify compatibility. Please note that the Frigidaire remote displayed on the right (even with an LCD screen) is not compatible with Ambi Climate 2nd Edition.